Combination Play: Champions in the making? Friday's matchup between Benfica and FC Porto was announced as a potential title decider. With the teams level on points, the final score wouldn't necessarily mean mathematical certainty about the eventual Portuguese champion, but it would definitely make a dent on the losing team's aspirations. Both coaches weren't exactly inspirational in their press conferences and therefore a cagey match was expected. FC Porto surprised their opponent by not sitting back, soaking pressure and taking advantage of Benfica's high line, rather exerting pressure up front, with Janko with clear instructions to occupy Luisão's area, Lucho told to mark Javi García (or Garay, depending on who brought the ball forward) and Moutinho with an eye on Witsel, should he drop back to get the ball. Vítor Pereira was no doubt trying to choke Benfica's build-up play by placing his midfield between their usual two banks of five. Benfica were clearly not expecting this attitude from their opponent, making a lot of wayward passes in their build-up, where they usually are very good. However, the thing that really got the game going and opened it up was Hulk's goal, after just 7 minutes. FC Porto became even more confident and Benfica seemed a bit overwhelmed by it all. For the first 20 minutes, the Dragons were almost perfect in stopping the ball even getting to Aimar - and the fact that neither winger dropped back to get the ball out didn't help either. With Witsel instructed to get side by side with Javi García and Aimar not helping defensively, FC Porto's triangle-shaped midfield were able to bypass their two banks of four, with loads of space between them. 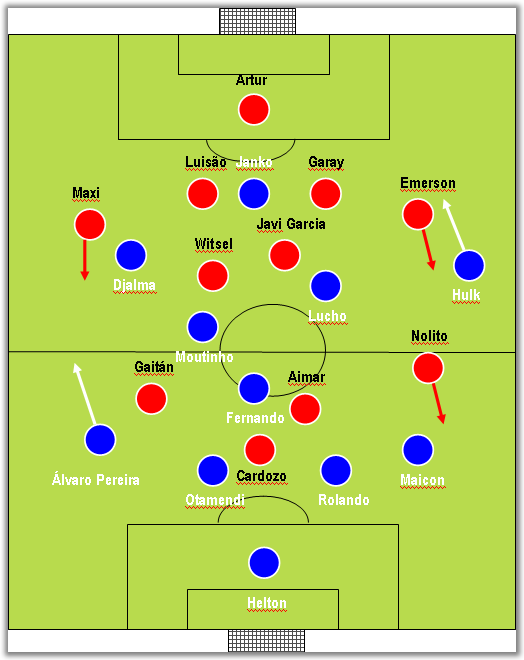 To make matters worse for Benfica, Djalma was excellent both in dragging Maxi Pereira out of the wing and into the middle (which meant Maxi didn't know whether he should follow him or hold his ground), and in helping out defensively, so the visitors' midfield wouldn't be overrun. 20 minutes into the match, the home team started balancing things out. Witsel pushed forward and left Javi García's side, meaning that he could finally be the link between defence and attack, but it also meant that he was able to pressure FC Porto in their own build-up, winning the ball back closer to FC Porto's goal. The Dragons, in turn, dropped back, possibly with an eye on Hulk's speed in behind the Eagles' defence. Fernando spent most of the first half getting close to Nolito (who got the nod ahead of Bruno César), trying to stop him from turning to goal and therefore helping out Maicon not to lose his balance. However, after the initial period, Nolito managed to either turn or get the ball out of his area and into Aimar, who usually had more space to get into, since Fernando was busy elsewhere. It was no surprise that Benfica levelled the score on 41 minutes - particularly because FC Porto have seemed too soft on set pieces throughout the whole season. It was more of a surprise to see Benfica getting one goal up in a set piece they have been doing all season long - apparently, the away team's scouting department has a few things to sort out. FC Porto's plan for the second half (drop back and look for the breakaway, as seen in the picture below) had to be reviewed. Vítor Pereira immediately turned to James Rodríguez, but, in a decision that had everything to potentially cost him his job, replaced Rolando with the Colombian, meaning that Maicon would step in as left centre-back and Djalma as the improvised right-back. As previewed elsewhere, Benfica couldn't control the match and the team started breaking in two sides of five, leaving the midfield area wide open. In fact, it was precisely because of that that James and Fernando were able to win the ball back 65 yards from Benfica's goal and run upfield at ease - they weren't up against any opponent until Luisão came out, near the box. It was the 63rd minute - the score was level again. FC Porto's second goal was clearly a punch in the gut for the Lisbon team and the team started to collapse both physically and mentally. Spaces opened up and it was certainly no surprise that shortly afterwards Hulk found space to run into behind Emerson, which gave way to the latter's ejection. Jesus' option to go with Gaitán as left-back meant Hulk and Djalma were up against Gaitán and Nolito - not exactly the two best defenders in the world. As expected, the away team were suddenly awash with space to run into. With an extra man, FC Porto were intelligent in moving the ball from side to side, trying to tire Benfica out. By the time the match was drawing to its end, Vítor Pereira took another huge gamble by replacing João Moutinho with Kléber, telling the team loud and clear that he wanted to win the match. The away team would score the winning goal with James' free kick to Maicon's head seconds later. FC Porto were perhaps a bit fortunate in getting the win, but their initial plan to pressure Benfica really turned the game on its head. Benfica showed their usual strengths, but were also predictably weak in the aspect that most aficionados know by now: as the game goes on, the team tend to break in two and leave their back four exposed (with no one around but Javi García to help out).